Achoo! This spring has been a doozy in our region, with dramatic weather shifts, big winds and tons of allergy triggers. As allergy season moves into high gear, we’re getting reports that for many patients, seasonal allergies are especially bad this year. Here’s the scoop on seasonal allergies and how you can get relief. While they can be pretty unpleasant, allergies are actually the result of your immune system trying to do you a favor. Allergies happen when your immune system reacts to an outside substance, and your body thinks that invader is dangerous (even when it isn’t). Your body’s natural reaction is to fight back, and its primary weapons are compounds called histamines. For these histamines, job number one is getting rid of the irritant by sneezing, creating mucus, tearing up or coughing – classic allergy symptoms. The most common seasonal allergy triggers are mold spores, and pollen from trees, grass and weeds – that’s why spring is such a bad time for allergy sufferers. Most of us have heard of the plant known as ragweed – and with good reason, since it’s an especially prolific pollen producer and one of the most common allergy triggers around. One of the most common seasonal allergy manifestations is allergic rhinitis, also known as hay fever (even though it has nothing to do with hay or fever). More than 40 million Americans according to the American College of Asthma, Allergies, and Immunology (ACAAI). 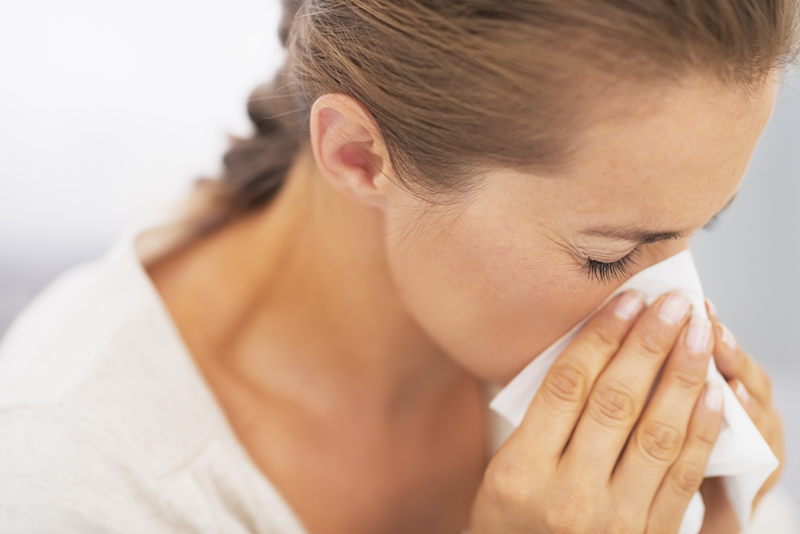 The most common seasonal allergy symptoms are sneezing, runny or stuffy nose and watery eyes. But allergies can also affect the ears and lungs, leading some patients to confuse season allergy symptoms with a cold or ear infection. The plants that most often cause allergies thrive on warm days and cool nights. That’s why spring is the peak for seasonal allergies, and according to the ACAAI, most seasonal allergies are at their worst from the end of February through the beginning of summer. In our region, April and May are peak season as pollen comes out in full force, and on warm, windy days, pollen tends to be at its absolute worst. However, some seasonal allergy sufferers also find summer and fall tough as well. When Do Allergies Usually Start? Most seasonal allergies tend to pop up during the elementary school years and then wax and wane during your lifetime. Many of our patients see symptoms diminish during their late teens and young adult years only to re-emerge once they’re in their 30s. Unfortunately, some patients with no history of childhood allergies develop symptoms later in life, and allergy triggers can also change as your age and change locations. On the upside, your immune system often settles down as you move into the senior years, so some patients see a decrease in allergy symptoms as they age. How Can I Relieve My Allergy Symptoms? Immunotherapy: allergy shots (or immunotherapy) from your doctor can be one of the most effective ways to treat seasonal allergies. These shots work kind of like a vaccine in that a small amount of the allergen is injected into the patient’s arm. This triggers a mini immune response that can block a more significant allergic reaction when the patient comes into contact with the allergen. Injections usually start off around once a week and then gradually become less frequent. Shots can provide relief from more than one allergy. Our patients are also having success with new immunotherapy tablets take orally for a limited range of allergens, including ragweed, grass, and pollen. Prescription nasal sprays: When a runny nose and sneezing are the main problems, patients can access a range of prescription nasal sprays containing corticosteroids (to reduce inflammation) or antihistamines (which prevent congestion by blocking the histamines your body produces). Over the counter medications: while some patients require prescription strength treatment, many of our patients have success with over the counter medications and nasal sprays. These include over the counter antihistamines like the popular drug Loratadine which often works well for treating runny nose, watery eyes and sneezing. Over the counter corticosteroid nasal sprays like Flonase are also increasingly popular, but as always, patients should consult their primary care provider before trying a new medication for seasonal allergies. Keep an eye on the weather report, and pollen count reports every day, and plan your outings and activities accordingly. Keep the windows of your house closed during allergy season. Wear a filter mask when mowing the lawn or working outside. Together with the right medications, these simple practices can help make allergy season more comfortable and fun for you and your family!